I don’t doubt that it is a worthwhile and creative idea to allow the very rich, or even the quite rich, a mechanism to contribute to the NHS to add further resources to it. In the same way, at a lower income level, all those who don’t need a heating allowance should be able to tick a box to return it automatically. All well and good, and not much damage done. But the incompetence lies in his economic and political attachment to socialism. Tragically, it is one he shares with almost the whole house of Church of England bishops. They seem almost to have been cloned in this respect (with literally one or two honourable and notable exceptions). 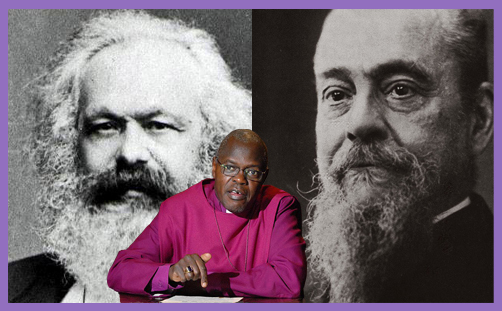 Archbishop Sentamu is convinced, despite the evidence, that putting up taxes produces more equality and a more prosperous society, which is a piece of socialist dogma. This is of course Keynes v Hayek. I think I would mind an archbishop taking such a partisan economic position less if he could explain why he was economically qualified to prove his analysis. But Archbishop Sentamu doesn’t either explain or display the credentials for the economic expertise his opinion ought to depend upon. It isn’t just him, however. How is it that so many Anglican bishops have adopted a socialist economic and political outlook (other than the dark conspiracy theory that it is on the basis of their socialist preferences that they qualify for preferment)? How do the authorities know that the Holy Spirit is a communist? Perhaps a church gets the leadership it deserves. Though this may be another part of the chicken and egg loop. It is the case, though, that Christianity in this country (and the Church of England in particular) has been tainted by the progressive theology of the ‘Nice’, and so failing to reflect the content of the New Testament. All mention of hell is taboo, despite the fact that Jesus spent more of his time warning about the reality of hell than teaching about anything else. ‘Judgement’, too, is off limits; and so is the great separation of the sheep from the goats, or the wheat from the tares. God forbid anyone should ever be called ‘divisive’. It’s not like Jesus ever entertained the notion of division or separation in his presentation of the Kingdom. But since the Church of England is prone to worship at the altar of cultural acceptability and conformity, rather than at that of the triune God revealed in the incarnation, it very much prefers the ‘Nice’ to what Jesus described and warned was the ‘Real’. An aspect of this devotion to the ‘Nice’ is soft (and sometimes not so soft) socialism. After all, wouldn’t it be nice to have some more equality in our society? Indeed, of course it would. Who would argue against that? But the compassionate heart needs to draw a little on the informed head if it is to find traction with reality. The compassionate hearts, the devotees of the ‘Nice’, however, seem so often unwilling to distinguish equality of opportunity (an excellent goal), from equality of outcome, which is the Marxist dystopia. Why dystopia rather than utopia? Ask the 90 million killed by Mao Tse Tung, or the 40 million Stalin sacrificed to deliver his utopia, and still failed. Yet even after the horrors and bloodbaths of the 20th century, idealistic undergraduates and naïve churchmen and women wonder afresh if the Marxist equality of outcome failed for some lack of something as yet not entirely yet spotted, and deserves to be tried again. Mathematical perspectives: Marx or Pareto? The hierarchy of the CofE is very familiar with the theories of Karl Marx, but they know less about Vilfredo Pareto. This is a shame, because if they knew more about him it might give them pause for thought before offering economic advice to the government in particular and the populace in general; and doing so in the name of Jesus Christ, who gave very little (if any) economic advice. One of Pareto’s equations achieved special prominence, and controversy. He was fascinated by problems of power and wealth. How do people get it? How is it distributed around society? How do those who have it use it? The gulf between rich and poor has always been part of the human condition, but Pareto resolved to measure it. He gathered reams of data on wealth and income through different centuries, through different countries: the tax records of Basel, Switzerland, from 1454 and from Augsburg, Germany, in 1471, 1498 and 1512; contemporary rental income from Paris; personal income from Britain, Prussia, Saxony, Ireland, Italy, Peru. What he found – or thought he found – was striking. When he plotted the data on graph paper, with income on one axis, and number of people with that income on the other, he saw the same picture nearly everywhere in every era. Society was not a “social pyramid” with the proportion of rich to poor sloping gently from one class to the next. Instead it was more of a “social arrow” – very fat on the bottom where the mass of men live, and very thin at the top where sit the wealthy elite. Nor was this effect by chance; the data did not remotely fit a bell curve, as one would expect if wealth were distributed randomly. “It is a social law”, he wrote: something “in the nature of man”. The shocking thing about the Pareto principle is that it seems to be a consequence of some law that goes far deeper than sociology or economics, but is almost mathematical. Rather like the Fibonacci principle, you simply find it everywhere, almost as if it is in the DNA of creation. The English physicist Derek (J de Solla) Price, (1922-1983) took the Pareto principle and began to find it applied almost everywhere where there were creative ventures. He expressed it as Price’s Square Root law. Price’s law was used, for example, to express the relationship between the literature on a subject and the number of authors in the subject area. It stated that half of the publications come from the square root of all contributors. So, if 100 papers are written by 25 authors, only five authors will have contributed half of the total number – 50 papers. But it applies much more widely; indeed, it actually applies ubiquitously. He found that it applied to companies, as in that context it was expressed as: if you have 10 employees, then you will find that three of them do half the work; and if you have 100 employees, then it turns out that 10 of them do half the work. He found it applied to the publications of PhD students. The median number of publications by PhD students was one. Half of the study group, however, had at least two; and half of that group had three; half of that group had four, and so on. The corollary is that in every creative venture there is a small number of people who are hyperactive or exponentially productive. It works for financial assets. If you take 10,000 people, the square root principle demonstrates that 100 of them have half the money, because the rule is that the square root of the number of people under consideration have half of whatever it is under consideration. And the end result is that 1% of people end up with most of the money. So, a recent Oxfam report stated that the world’s eight richest men have as much wealth as the bottom half of the world’s population. It reported the fact with surprise, as if this were some kind of recent and pronounced form of social injustice. Pareto and Price show us that it has always been true in all places at all times. Much hangs on whether you get your information from Pareto and Price on the one hand, or Oxfam and Marx on the other. The kind of analysis and efforts at redistribution you make according to Pareto and Price are very different from the ones suggested by either Oxfam or Marx. In case you think the theory is misapplied or too much is claimed for it, it even works for classical music. If you took 100 classical composers, you find that 10 of them produce half of the music that is played. If you then take the 10 composers and you take 1000 of their pieces, 30 of their pieces (the square root of 1000, roughly speaking) are played 50% of the time. We can be more specific. Five composers produce the music that occupies 50% the classical repertoire. They are, of course, Bach, Beethoven, Mozart, Brahms and Tchaikovsky. And even amongst their combined repertoire, 5% of the music they wrote occupies 50% of their music that is played. ‘For to everyone who has, more shall be given, and he will have an abundance; but from the one who does not have, even what he does have shall be taken away’ (Mt 25:29). What are the political implications of these figures? Pareto thought they implied the need for a small state that interfered less rather than more, and you can see why. State interference is going to make very little difference if this rule is in the DNA of things. Certainly, there ought to be political conversations about how one balances the dangers of destabilising inequality which, when over-pronounced, lead to revolutions (not that the revolutions achieve equitable redistribution of income – because pace Pareto and Price, they can’t and don’t! ); and the need for continual wealth-creating innovation with the concomitant inequality that emerges as a matter of law rather than only the failure of human generosity and political imagination. But to do all of one’s economics or theology from either soft or hard socialism is to fly in the face of mathematical, political and even theological reality. Which is why the constant leftish pronouncements from the House of Bishop in the CofE are so tedious, unhelpful and misleading. Theological perspectives: Augustine or Pelagius? I once worked for a vice-chancellor, my line manager at Sussex University, whom I liked greatly. He had one or two irritating flaws, of course. He was an economist, and when faced with a question he considered wholly irrelevant or fanciful, he would dismiss it and proclaim it ‘a theological question’. Given the disastrous record of economists to agree or predict economically, I thought this was plain cheek; and sometimes said so. In fact theological questions, and their answers, offer us the key to distinguishing between good and bad economic theories. Marx’s economics were poor for a number of reasons, but not least because he didn’t understand the reality of human fracturedness expressed in the theological concept of the Fall. The Fall warns against the idea of the perfectibility of humankind, or human society. So, if you take the theological idea of the Fall seriously, it acts as an antidote to a dangerously naïve utopianism, adopted by most of the Left. Associated with not taking the inherent fractured-ness of the Fall seriously is, of course, Pelagianism. It looks at humanity with a kind of severe uber-optimism, convinced that if one tries hard enough, personally or politically, humans can deliver on their moral (and political) aspirations. On the scale of personality trait at one end and poor theological reading of Scripture at the other, it is still not clear how or why one lands up nearer the hard-nosed realism of St Augustine on the one hand, or the starry-eyed humanistic utopianism of Pelagius on the other. But shift the theological furniture of the mind away from the Fall and the reality of sin, and political utopia begins to become more attractive than repentance and re-birth from above. ‘Ashenden’s law of spiritual incompetence’ states that there is an inverse relationship between spiritual authenticity and political pronouncements. In other words, the less confidence Christians have in the metaphysical, the louder and the more often they will take to making political pronouncements. The less confidence they have in the Holy Spirit transforming human nature (as St Paul prescribed in Romans 12.2: ‘Do not be conformed to this world, but be transformed by the renewal of your mind’), the more they look to political solutions for the human condition. From time to time the Archbishop of York, with a keen and commendable eye to theatre, stages public baptisms by immersion outside York Minster. They suggest a model for human transformation consistent with the teaching of Jesus and the encouragement of St Paul. He is much to be commended for them. It’s a pity then that he divides his loyalty to Jesus and the spiritual dynamite (‘dunamis’) of the Kingdom, with an unreconstructed allegiance to the dogmas of Marx and Keynes, which have proved remarkably less effective at transforming either individuals or societies.